I'm making some changes to how I run my photographic business. Its a complicated process, and has involved long discussions with my accountant, and the probable changing of my tax status. The consequences of this are that firstly, I'm going to be concentrating virtually exclusively on my my core library / stock work, and secondly there will be much less chopping and changing cameras, as from now on, I won't be getting as much tax relief as I did before. In the long run this will be to my benefit, but in the short term it means that most of my buying and selling has to be completed by the end of this month and my next (financial) year, starting in April has to be fairly quiet on the gear front, or else I will suffer a financial penalty. I have therefore been deciding what I REALLY want to be using for the next year, since I'm pretty much going to have to stick to it. So lots of stuff is for sale on ebay and a few days ago I made what is going to be my last camera purchase for a while. This was another NEX-7. Ever since I started using a NEX-5n and finally got my hands on my first NEX-7 just after Christmas, this has been the probable outcome. Much as I like the stimulation of other cameras and lenses the NEX-7 is far and away the camera that gives me the majority of what I want. Indeed I'd go as far as to say that its the camera thats closest to perfect for me, that I have ever owned. The other day I was out shooting with it and the thought crossed my mind "This is too easy!" And in fact it is. The NEX-7 does what I want so effortlessly. All the compromises and techniques I've employed over the past few years to enable me to use a small light camera that gives me the image size and quality I require, are no longer necessary. The camera fits the way I like to work so well, that I have been almost forcing myself to use something else. I still haven't finally decided what else to keep, my heart says one of the Pens but my head says the NEX-5n, I'll see what wins! However in terms of what I produce and of course my continued financial well being, the NEX-7 is the most satisfactory "tool of my trade" that I've ever owned. Not for everybody, I hasten to add. This works for me, and wouldn't necessarily work this well for everyone. It may be the closest I've ever had to a "perfect" camera, but to other photographers it may be far from that. So why does it tick so many boxes for me and why do I struggle to come up with any negatives? I'm much more concerned about weight. My last big shooting trip was last Sept./Oct. during a 10 day heat wave. I was shooting stock plus some commissioned "People having fun on holiday by the coast" images for a client. 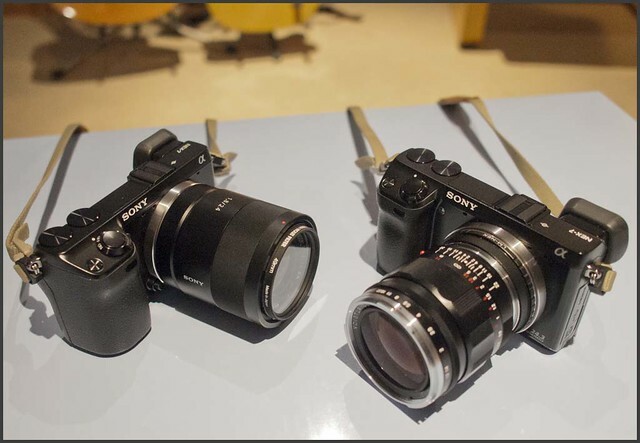 I took two Nikon DSLR's plus my Leica M9. After 10 days of continuous shooting, I could only walk for 20 minutes before having to lie flat on the ground to unlock my back. Not good. So I resolved there and then that would be the last time I did that. 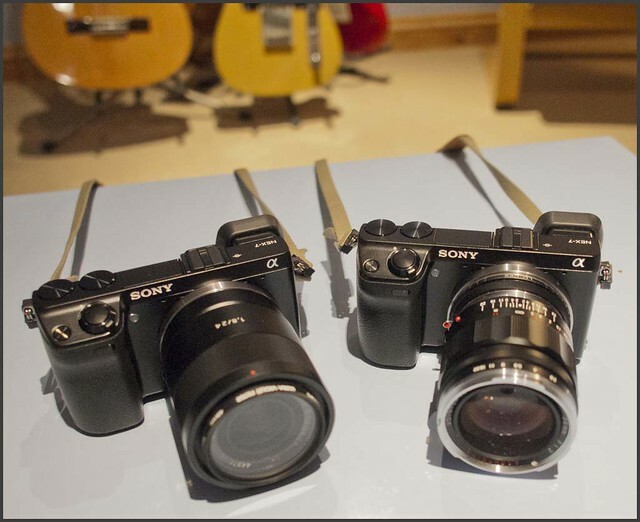 The NEX-7 is not that small, but compared to a DSLR its wonderfully light. It did take a while to get used to it. Interesting that now whenever I pick up my Olympus E-P2 it feels "big". How things change. Overall its a much pleasanter experience carrying the NEX-7 around. Fitted with most NEX lenses its a light combination, though my m-mount lenses are somewhat heavier. However compared to a Nikon D7000 and two zoom lenses its a great improvement. I've grown to really like this. The camera, though small, feels very substantial and built well. The controls are small though comfortable and I personally am happy with the layout. I really like the control wheels on the top of the camera, though I do knock the right hand one and accidentally change settings occasionally. Once set up I can change everything I need to and I mostly keep this very simple. The shutter is positive and fast. The whole thing is much less "fiddly" than m4/3. The EVF is just great. Lovely and clear and polaroid sunglasses friendly. Since I rarely use it in very low light it doesn't cause me a problem. As to the AF, I realised a few days ago that I have never had a single focusing error. OK I'm not shooting sports or anything thats fast moving, but its accurate and reliable. Maybe not the fastest when measured but its still pretty speedy. Give me accuracy and reliability over speed every time. I've used Canons and Nikons that are blindingly fast but none of them have been 100%. The EVF has eye level control and switches to the screen when you look away. 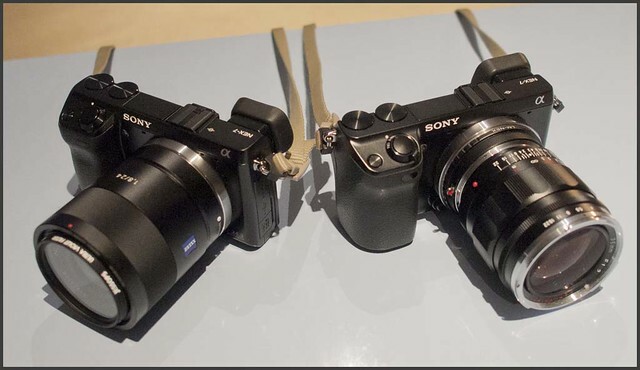 Going back to my m4/3 cameras which have switchable EVF's is now something I don't relish. Why don't all cameras with electronic viewfinders do this? At low ISO's, which I use for the majority of the time, absolutely superb. Not quite as sharp as my Leica M9 but used with m-mount lenses, not that far away even allowing fo the AA filter. Resolution is obviously impressive with all those pixels. Colour can be somewhat flat, but its accurate and of course easily tweakable in Photoshop. For me this is the key feature. It allows me use my very high quality Voigtlanders which show just what the sensor is capable of. Focus Peaking is just great as far as I'm concerned. The best system I've ever used for MF lenses. Others seem to disagree, which puzzles me, as after working with it for a while, I can't imagine being without it. Great video. Useful high speed burst mode and auto HDR which came in very useful for the property shoot I did recently. Menu system could be better. There is too much of it and some of it isn't logical. The tiltable screen is versatile for horizontal shots but like many of these isn't any good for vertical. A battery grip would be nice for certain uses and to balance larger lenses better. So all in all I have very positive feelings about the camera. I enjoy using the camera, which means that I don't really think about it much. When I sold my Leica M9, I wondered just how much I would miss it. Using the NEX-7 has meant that I don't miss it at all. To me it has all the advantages of the M9 - Great resolution, the chance to use superb lenses and a comfortable size and weight without the disadvantages - No AF, can't use macro or telephoto lenses, the innacurate framelines. Add in the fact that for a high quality camera its not that expensive, its unobtrusive and reasonably aesthetic and its virtually everything I want. I've waited some time and gone through a lot of gear (and money!) trying to find my "holy grail" of a camera, and it seems I've found it. Like the NEX-5n before it, the more I use this the more I like it, which is the opposite of my usual camera owning experiences. Finally, a word on the commercial consequences. Since the new year I've noticed a changing pattern in my sales. The film scans are selling well, and sales in general are up. However the biggest change I've seen is that via my microstock libraries, sales of large images have increased. By this I mean really large images, A3 and higher. I suspect two things are contributing to this. First printed reproduction isn't disappearing as quickly as might be imagined and secondly the microstock libraries are beginning to eat into the territory that "conventional" picture libraries have always supplied. i.e. The print publication markets. The NEX-7 is obviously going to very useful in helping me supply images for that. 24MP is a lot of pixels. Add in the fact that by just shooting 2 images and stitching them together I can produce 100MB files and you can see the possibilities. So it looks like, temporarily at least, I will be mainly sticking with one camera system. I must admit I do have a sense of relief at this. Plus there must be something going on as having handled the Olympus OM-D and absolutely loved it, I have resisted it and have no intention of buying one. As soon as I saw that Amazon had the NEX-7 in stock finally I jumped at the chance of buying another one. Because if something did happen to my NEX-7, I would be dissatisfied with using anything else. Hopefully with two of them I won't have to contemplate that.